Cut your operating costs by reducing your heating, cooling, and hot water bills with Waterless™ DX geothermal technology. Heating and cooling with traditional systems fueled by oil, propane, gas and electric can be costly when used commercially. Luckily, you don’t have to rely strictly on them. A Waterless™ DX Geothermal system operates solely off of electricity and can eliminates the need for fossil fuels. It will heat and cool your building by using the power of solar energy stored in the our earth from the sun. Create a comfortable atmosphere for customers and employees with a Waterless™ DX geothermal with a quiet operation and consistent, comfortable heating and cooling. You will love the savings & reliability a Direct Exchange (DX) Geothermal system can offer you for your commercial building. Additionally, a DX Geothermal System can provide you with supplemental hot water, for the use of showers, kitchens, and laundry rooms. 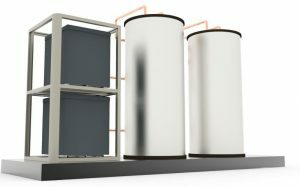 Depending on which hot water option you chose the system is capable of providing 50% of your hot water or as much as 100% of your hot water needs for your business. The system is extremely reliable, ensuring you can focus on business, not fixing inefficient or expensive traditional HVAC systems. Installation is flexible and easy, and offers a wide range of loop options with unparalleled flexibility when it comes to determining where the ground loop can go while taking up very little space outside. The system is extremely reliable, ensuring you can focus on business, not fixing inefficient or expensive traditional HVAC systems. Installation is flexible and easy. A DX geothermal system is extremely environmentally-friendly. Position yourself as environmentally conscious and be recognized as a green brand. Because of its efficiency and low environmental impact, a DX geothermal systems can offer you many rewards for years to come. There are several recognized benefits for commercial DX geothermal use. See a full list of benefits here.